We've lived in our neighborhood for sixteen years. 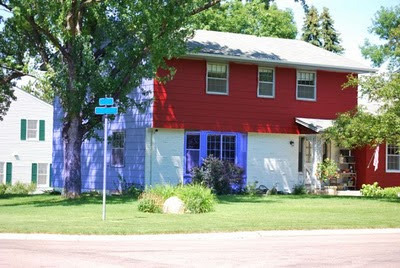 During all that time, we always have called this the "blue house." You can barely tell why from this picture, but look on the left side. It was painted blue. 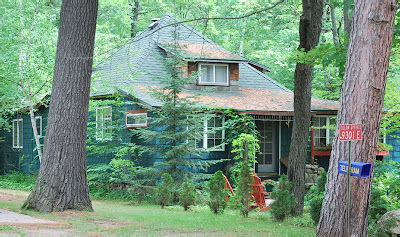 Blue trim surrounding the windows. 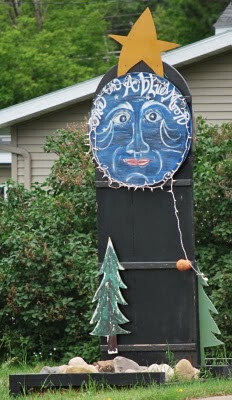 At one time, a blue spruce in the yard. At Christmas, it was decorated in blue lights. We always wondered if there was blue carpeting too. But it changed hands a year or two ago. 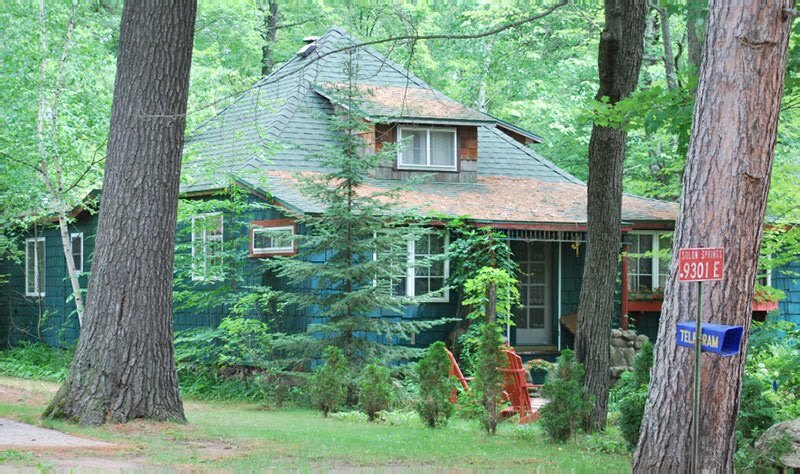 The new owners considered the situation with considerable care. Patches of paint appeared near the garage, then changed color. Next, in a bold move this spring, the blue paint on the bricks (lower front) turned white. The final scheme began to emerge as a red patch grew to encompass an entire section on the right. Finally, late in June, the final answer emerged. Red it would be! With that splash of white for accent. And as I drove out to the store on June 30 to buy some items for our Fourth of July celebration I saw the work in progress. A red, white and blue house! Quick! Back home for the camera. I'll bet no one else caught the celebratory mood. The actual photo doesn't do justice to the original blue color. Perhaps 16 or more years of sunshine has faded it a bit. If only you could see it as it appeared in my mind. 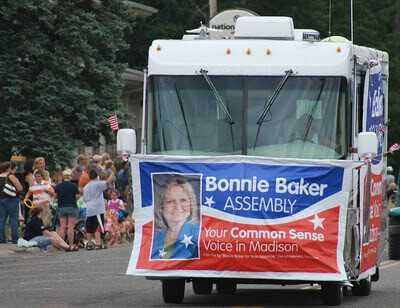 I was back in Solon Springs on Sunday to watch the parade. 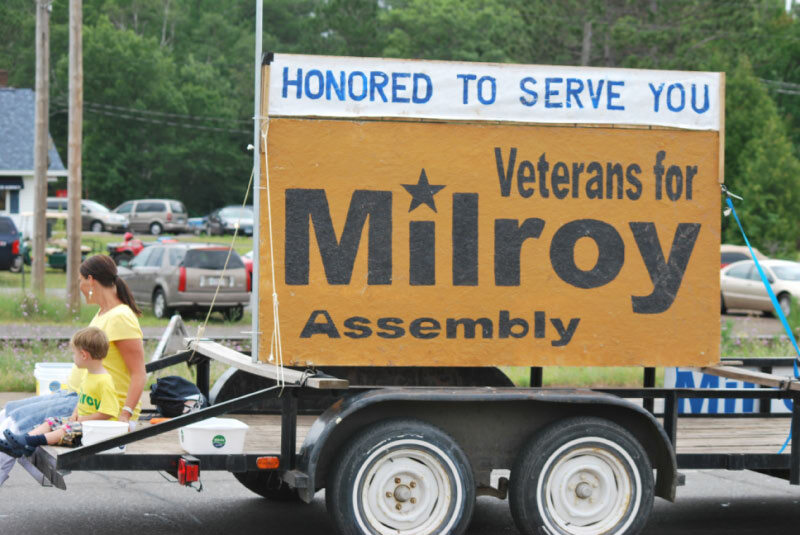 Solon Springs knows that it can't compete head-to-head with Gordon on the Fourth of July. 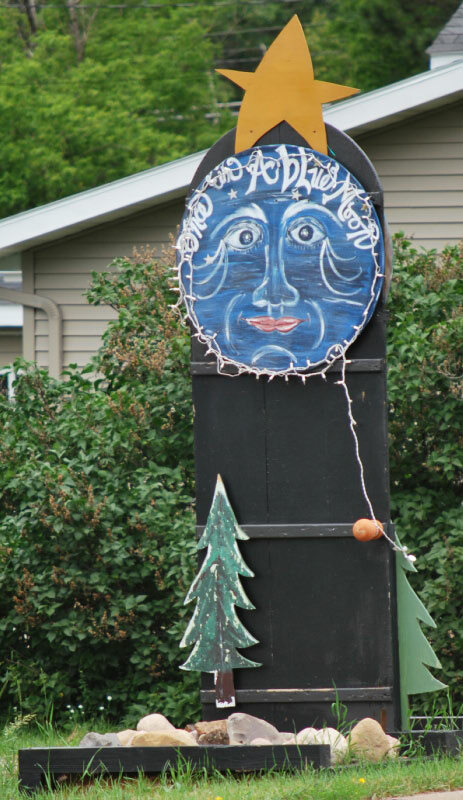 The Gordon fireworks display is known throughout the northland. They call it "world class" and they aren't kidding. It bests many major city displays. 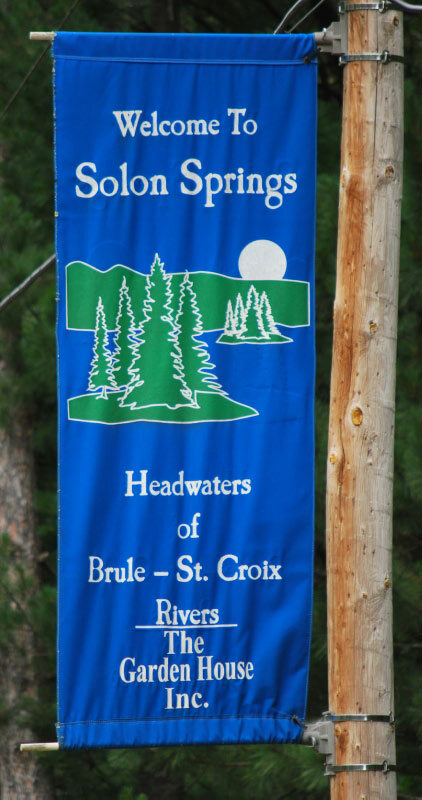 So Solon Springs holds their "Summer Festival" a week later. Bingo, Toilet Races, they've got it all. As the Northwoods shopper schedule shows, the parade is held on Sunday afternoon. So I headed into town and took a few photos. Naturally, the parade started off with a presentation of the colors. 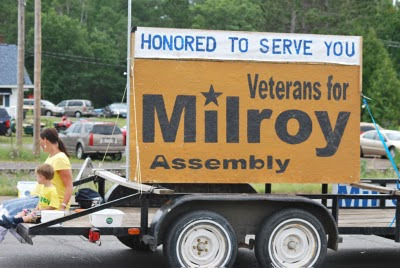 They came from Legion Post 499 in Gordon. 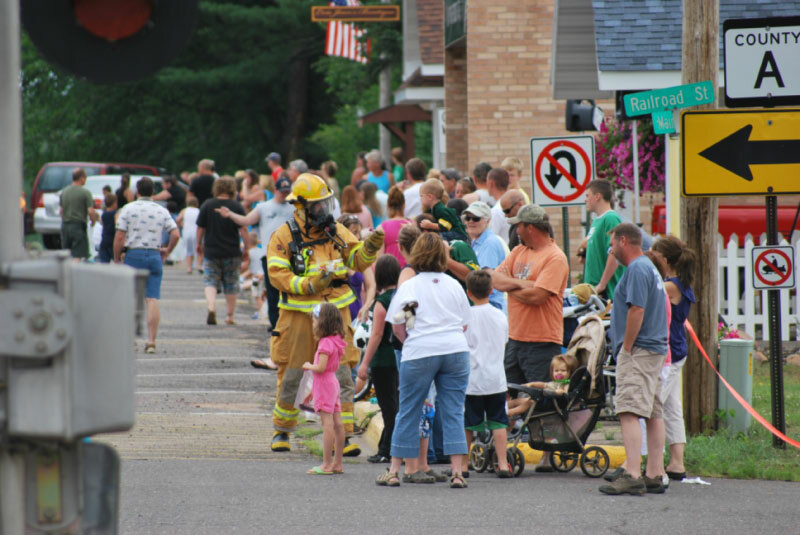 The fire department followed close behind distributing candy to the youngsters. Smokey the bear followed next behind the fire department. Seems appropriate! 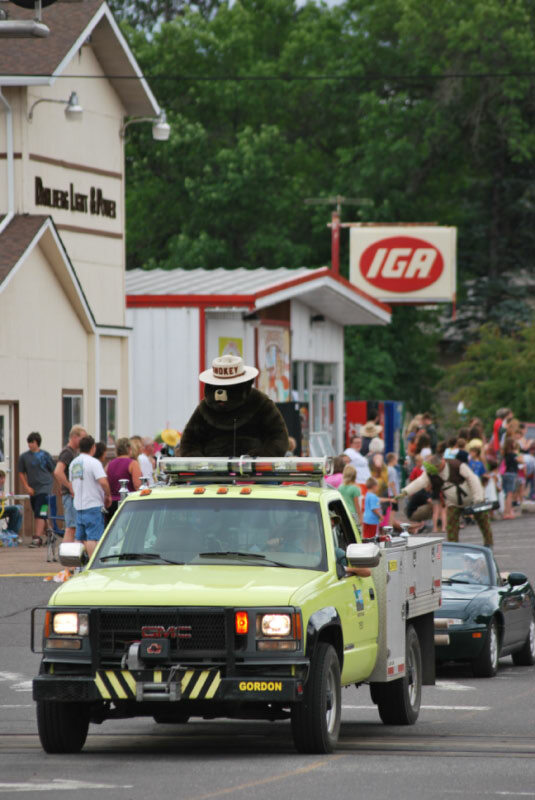 Now this bear didn't seem as happy about his situation. He belonged to the bow-hunters' exhibit. I hope these guys take care of the local bear that has been picking our raspberries and scaring the daylights out of Linda! 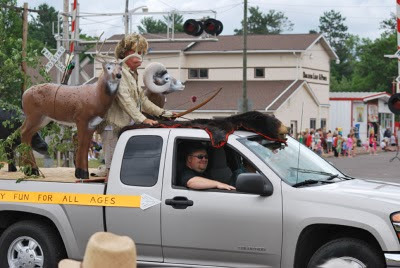 No politician can resist a parade. Both the incumbent and the challenger rolled out for this one. Even the long-term powerful state senator, Bob Jauch, made an appearance. 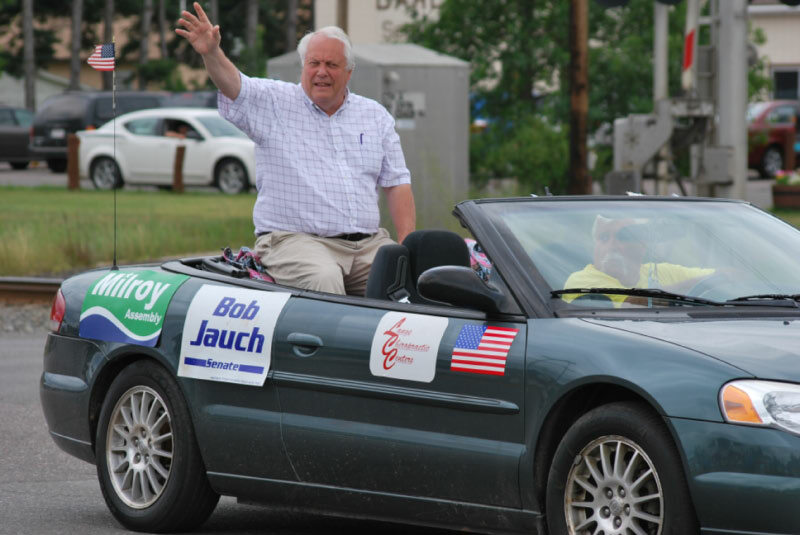 Jauch represents an area of several counties in northwest Wisconsin and has done so since 1986. 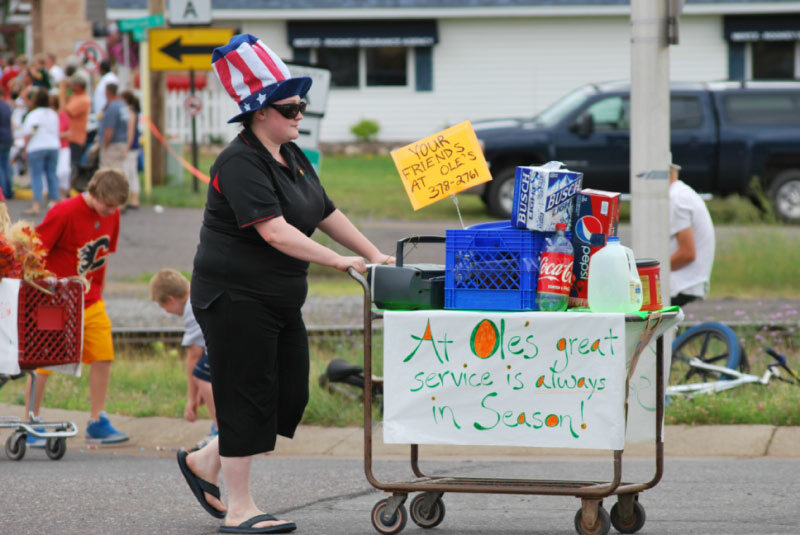 Ole's IGA (visible in a couple of the photos above) was closed for the parade. The staff was out marching in it! 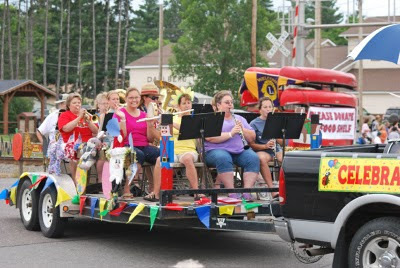 And, of course, no parade is complete without a brass band. Solon's played a joyful tune. Well, that's it. It was over in thirteen minutes. Still, it was worth the drive to see a genuine small-town celebration. 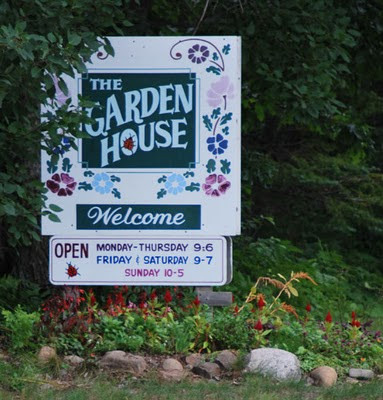 We were at our lake cabin in Northwest Wisconsin in the spring and took a trip to nearby Solon Springs to visit The Garden House, our nearby nursery. They stock a surprisingly large selection of plants. 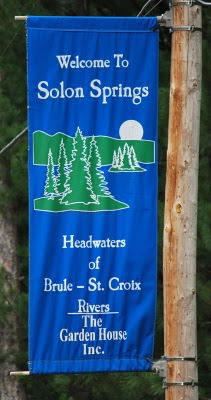 Solon Springs is our nearby center for the arts. They host a summer concert series, "Music in the Park" at the Lucius Woods Performing Arts Center. There are a few artists in residence. And the village contains a number of terribly cute homes. In short, this is about as close to Carmel-by-the-Sea as you are going to find in the north woods of Wisconsin. But, as we approached the town along U.S. 53, I could see that something was clearly missing. 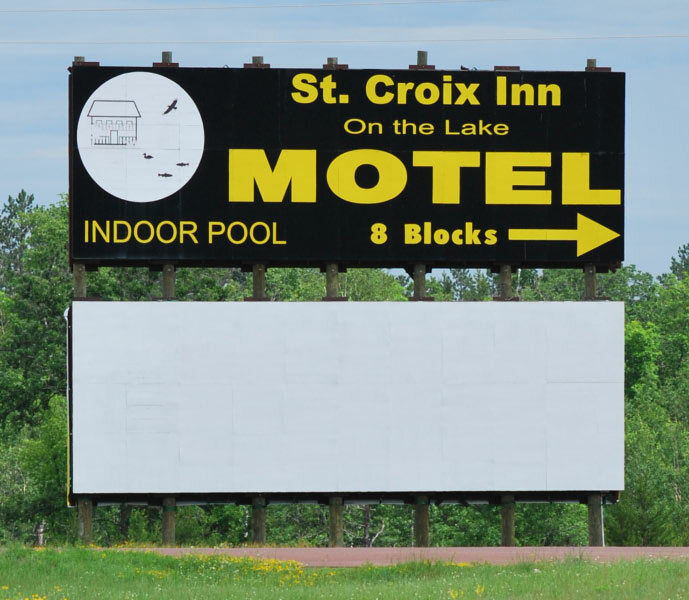 That blank billboard had long held a sign for Prevost's restaurant and bar. 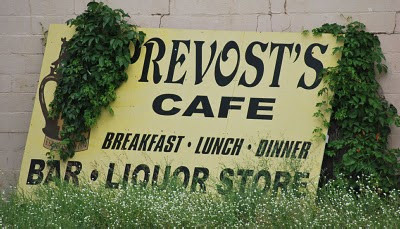 I had always thought of Prevost's as the heart of Solon Springs. 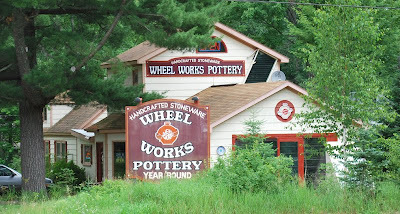 For many years this was the place to stop for a hearty dinner. Roast beef, pork or turkey served with a big heap of mashed potatoes and gravy. Green beans? You bet. All on a heavy white oval platter. 1950’s small town cuisine preserved into the twenty-first century. I can hardly believe it is closed. Later, I found this article in the Superior newspaper that tells the sad story. Was it the location? Was it a failure to keep up with the times? Hard to say. But here is the building, visible on the corner in the second photo, taken from a long block away. When we stopped at the nursery just outside of town on our way back to the lake, Linda asked about restaurants.
" Well," the lady began slowly, "for dinner, White Birch, but after that, the pickings are pretty slim." "Blue Moon has great cinnamon rolls and she serves sandwiches and soups." We need more information. We have never heard of Blue Moon. 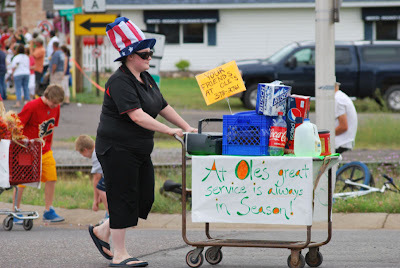 She describes the location and it is a place we passed on "Old 53" near the ballpark. We check it out as we leave. No sign of what the business is, but sure enough there is a blue moon out front. We’ll have to give it a try. Perhaps it will become the new Prevost's.